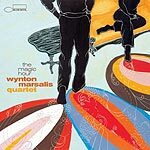 CD review: "The Magic Hour"
No one thinks more about jazz than Wynton Marsalis. He is one of the music's most intellectual artists, a man who seeks not only his muse, but his place in the larger canvas of the history of the music. Some would argue that he thinks too much. That there's too much thinking and not enough feeling in his trumpet playing; too much technique and not enough swing. That his playing is brilliant, but lacking in joy, sorrow, celebration or loss. And so Marsalis' new album, his first on the jazz specialty label Blue Note, is noteworthy not for any stylistic innovations or overarching compositional grandeur, but for the loose, swinging approach his quartet has, and for the pure joy in his own playing. From the opening notes of "Feeling of Jazz," it is clear that Marsalis is concerned less with technique and more with, well, music. There is a celebratory spirit running throughout that hasn't always been present on Marsalis' recordings. It is similar to the upbeat atmosphere of "In This House, On This Morning," his 1992 gospel-tinged opus. The opening track, the above-mentioned "Feeling of Jazz," is very similar in attitude and subject matter to "Now You Has Jazz," Louis Armstrong's paean to the music in the 1956 film "High Society." Dianne Reeves' vocal has the same love of life that Louis had, and the song itself has the same kind of bouncy flow to it. Most surprisingly  and rewarding  is the pure joy in Marsalis' own passages. There's a real sense of his native New Orleans here that has so often been absent from his music. The second song, "You and Me," is a little dance-type number with a cute melody that sounds like a lost filler from a 1950s' musical  the kind of song that the Fred Astaire would dance to as a transition between scenes. And as with the first track, there's a definite sense that Marsalis is allowing himself to have fun. "Free to Be" is likewise a bright, bubbly uptempo number marked by his own lithe trumpet lines. "Sophie Rose-Rosalee" bounces around like Vince Guaraldi, and Bobby McFerrin brings a New Orleans sensibility to his vocal on "Baby, I Love You." Has Wynton Marsalis ever displayed so much joy playing before? It is the melodicism of the compositions that also sets this album apart from earlier Marsalis efforts  his songwriting has rarely been known for hummable tunes, but they're here in abundance. Songs that stick in your head, the way, say, Sonny Rollins' "St. Thomas" or Bobby Timmons' "Moanin'" do.